When a student says, “Mr. Pace, can I make a civilization of unicorn-people who live on rainbows and eat glitter?” He answers, “Yes, please!” Tyler Pace is the Pied Piper of creativity at The Lexington School, and he takes the lead with the dynamic energy, passion, and imagination befitting such a role. Tyler came to TLS almost a year ago. Hired to spearhead a program called “Imagine This,” a design-thinking based, special class for kids in grades 1-5, Tyler’s enthusiasm for his job is contagious. Being around him makes you want to see things in different ways and know more about everything. Want to know a few of his secrets? Lean in and listen. Tyler: “Kids never cease to amaze me. They have a limitless capacity for creativity and innovation, and they inspire me each day to try to look at the world with the unbridled joy they bring to my classes. As I reflect on my time here, I can say that the most important lesson I’ve learned is when it comes to teaching creativity, you have to learn from the students. Most people have creativity in them, but BEING creative is another matter. It can be scary to create something, to try something new or to express something in a different way, because you open yourself to the possibility of feedback, criticism, or even judgement. That’s tough for kids! To nurture creativity, I start with instilling in my students a sense of EMPATHY for their classmates and an appreciation of the positive things that can happen when they make themselves vulnerable. At the beginning of the year, we spent a lot of time talking about why empathy matters, the power of coming together as a team and kindly acknowledging what other people make or do, especially if it isn’t right up our alley. The result, I think, has been a surge of student innovation. When kids aren’t afraid to mess up or do something off the wall, really cool things happen. We’ve done some neat projects, but my favorite moments usually occur when a student realizes that they can take the brakes off of their imagination. After all, most students live in a pretty structured world today- much of what they do is lined up for them without a lot of wiggle room. This isn’t a bad thing, by any means. We all know that kids need structure. But true creativity and true imagination blur structural boundaries and embrace the unknown. That’s what we try to accomplish in our classes. If you want to make a superhero whose power is to blow bubbles to make people laugh, that’s fantastic. If your fairy house, built for Floridian fairies seeking refuge from a hurricane needs to have a Jacuzzi made out of bark and rocks, that’s amazing. Go for it! In Fall 2017 Pinpoints article, Lucy McKinstry explains how “Imagine This,” works: With an average class size of 12, all sit in a circle – no front row, no back row – ensuring everyone can look each person in the eye and that facial expressions are visible. 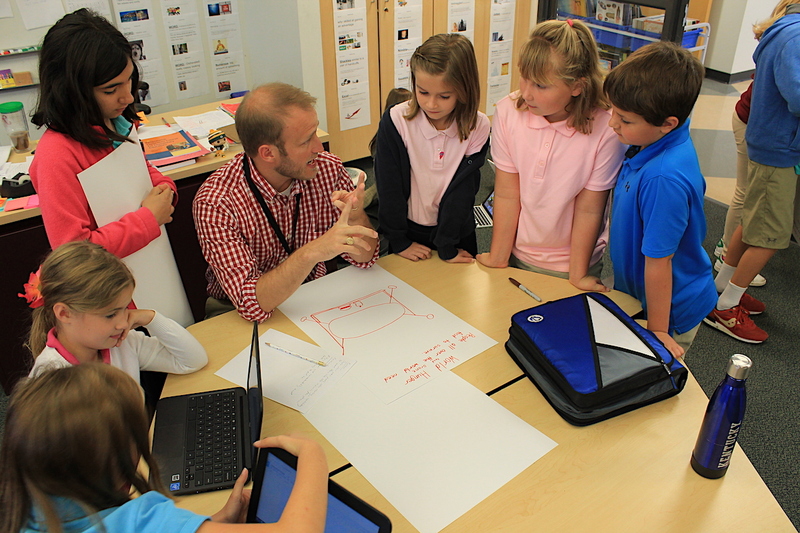 With an egalitarian structure to the class, Mr. Pace and his students engage in the Socratic method of discussion, asking and answering questions to stimulate critical thinking. Honoring Mr. Pace’s reverence for nature, class is held, from time to time, beside the Scarlet Gate trees and stream. Students flourish as they are given the opportunity to explore their intrinsic curiosity and creativity, and they relish the forum that allows natural conversation to flow easily. With this untraditional classroom, there are no grades. Assessment comes in the form of feedback by considering the question that was especially challenging to you and asking how can you improve your participation in the group next time. There is no homework. But that doesn’t mean students don’t think about, talk about, sometimes even dream about problem-solving activities they’ve been a part of and conversations they’ve had in class. They certainly take their lessons home with them.